For 2013 I am going to step out of my comfort zone. That is kind what this years theme is… so why not in glass as well? Normally, I like my pieces tightly structured. I like them to fit together like puzzles. I meticulously cut out the patterns to ensure that they fit together like a puzzle. But I am not going to do that with this next piece. The next oe is a buddha window. Last summer I had all these ideas that I wanted to get down on paper. I never really managed it. the transition from in my head onto paper is not an easy one. I do not have the drawing skill for it. I can copy things, but freehand creating is much more of a problem for me. The drawing of the pattern is, by far, the most difficult aspect of the project. Coming in a close second, for difficultly, is color selection. This part also takes me forever. Not as long as the pattern making, but certainly longer han I feel it should. So this time, I am shaking things up. There are some organic pieces on Etsy.com that move me. I don’t know about copyright laws and all that, so I will not include and image, but you can find it here. And here. 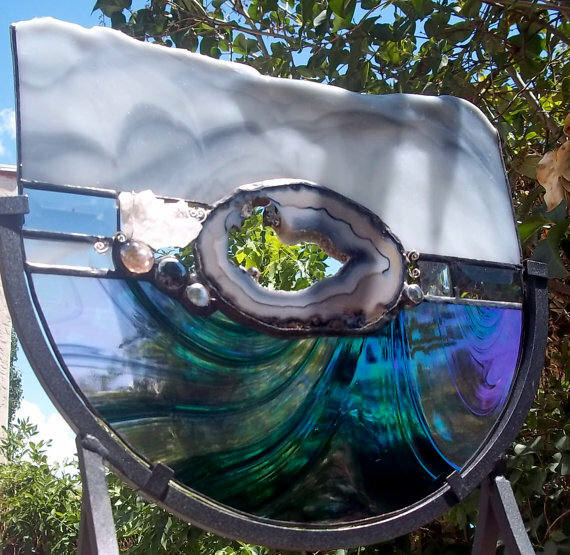 they are abstract pieces, like someone has a super cool piece of glass and just built a window around it, using organic shapes and no pattern. Glass globs and sliced geodes are often a component. Artist is rneely, from sandcarvigworks.com, out of Gand Junction, CO and Etsy. This one I particularly like for several reasons. The artist gets all 3D, with the use of the crystal cluster, for one. He/she adds in some wire swirlies, which is a current fondness of mine. And lastly, using the rolled edge of the white and grey opaque glass, in its natural state. All of these things make me like this piece. And the iridescent, swirly glass. Love it. So I am going to incorporate almost all of these elements in my buddha piece. The wire add-ons and the glass globs, for sure. Not the crystals or geodes. Though I might in a later piece. I’m still in the process of thinking things through, but I have the pattern copied, and am finishing up a quicky commish for someone. then it is time to grind a crap-ton of glass globs. ugh. It will be sensational when it is done. Thanks for sticking around, and Happy 2013!! ~ by kellig on January 13, 2013.